The Luminous Starseeker mount and Twilight pet are the two latest additions to the Blizzard shop, and the color shifting duo make a striking — and adorable — pair. If you haven’t yet gotten your hands on the new pet and mount, here’s your chance! Blizzard was kind enough to give us four North American bundle codes to give away to our readers. The code will grant you one Luminous Starseeker and Twilight pet combo — and all you need is one, because they’ll unlock account-wide for all of your characters. If you missed the announcement, you can check out both of them in action in Blizzard’s video below. To enter and win, simply leave a comment on this post before 11:59pm Tuesday, August 8. Please note that these codes are only applicable to North American accounts. 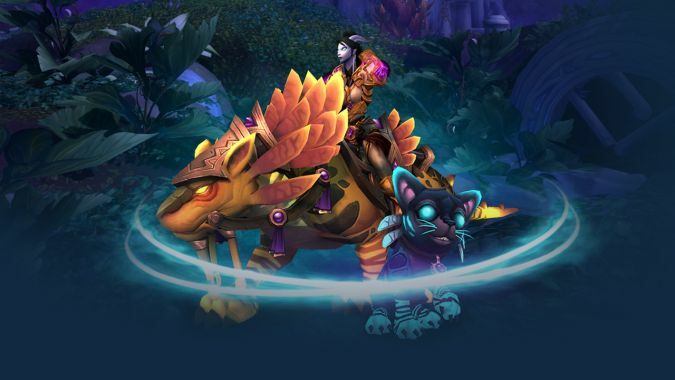 The codes must be activated and the mount and pet claimed by Sunday, August 13 — so don’t forget to check and see if you’ve won! Winners will be chosen via random draw, and winning codes will be distributed on Wednesday, August 9. Good luck!